site is owned by Information Specialist. Woohoo!!! My first update in more than a year. I FINALLY saved enough money to buy a new computer, a macintosh powerbook! And it only took me a week to figure out how to use it too ^_^. Okay, I have two new pictures by Satanzoujer in the fanart section. I've had them forever but couldn't put them up before now. Plus, I still don't have any image editing software in my computer, so I couldn't make a complete thumbnail of them. To see them, go to the fanarts section. I'm very excited about this new computer. I have a couple of projects in my mind which involve some very old animations. These are some of my favorites and I can't find any sites about them on the internet and I hope to attract the fans by my website. I've already started on one of them. If you are interested, see my In-The-Works section on my main site. Hello all. Several new fanarts have been posted. I am sorry to say that I wont have any major updates. My computer is very old, it's practically useless and I won't be able to afford a new one for a while. I can no longer make screen captures, or even scan pictures. But I will do my best to update with the fanarts which are submitted. A fanart that was submitted AGES ago but was hiding in my mailbox finally got discovered. It's in the fanarts section now. I finally got a phone line so I can start updating again. But I won't have new images for a while. My scanner got busted, and my screen-capture software keeps shutting my computer down as soon as I start using it. Hi all. It's been a while ^_^; With getting married, moving out of my old place and into my new one, between my honeymoon and deciding if I'm going to switch into an easier major to graduate quickly and earn much needed money, or stick with the impossibly difficult major that I love, I haven't had much time for updates. Especially since my new place doesn't have a phone line yet and I can't get on the net. I don't know when I'll get the phone line (Of course, I wouldn't need one if I had DSL ^_^;)but you'll know when I do cause I'll start updating again. Okay, this is really very embarrassing, but who sent me an RK midi? I accidently deleted the e-mail after listening to it. Can you please send me your e-mail address so that I can reply? Sorry for the trouble, and thanks. There is a new Rurouni Kenshin OVA!!! Click on the picture on the right for the larger image. 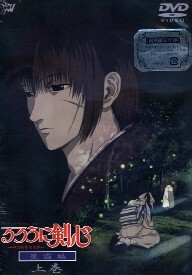 For more information, go to AnimeNation.com and type "Rurouni Kenshin dvds" in their search engine. I got this picture from there. If anyone has seen this ova, please give me information about it so I can post it on the site. Hello all! Chapter 12 of Rurouni For Your Thoughts is finally up! There is also a new songfic submitted by Princess Asuka. Enjoy! It's that time of year again. Time for the Rurouni Kenshin Readers Choice Awards. I encourage all to vote. Not for me, (I don't deserve to win anything till I finish the darn fic) but for the wonderful Sentora and his fic, "Darkness Before Dawn". Here's the link tell people about it and may the best fics win! Hi all. New doujinshi added. Site format is being heavily redone but everything will still work normally. Hello all. I've almost recovered 100% from my 'situation' and will therefore resume working on the site. First off, I have a new secion for Doujinshi that already has an extremely funny peice in it. Check it out. I'm thinking of giving the site a fresh look, but I'm waiting till after my exams to do that. I would have a new image gallery up but my screen capture software got deleated while my computer was getting cleaned for viruses and when I tried reinstalling it, I got a message saying that one of my drivers is missing. The file that contains my RK movie summary has somehow disapeared from my computer, so it'll be a while till I have time to rewrite it. The quickest update will probably be in the character section and the fanart/doujinshi section depending on whether anyone submits anything. After finals this week, I'll probably have chapter 12 of "Thoughts" wrapped up and ready to be proofread, so that may also be up soon. Until then, go check out the newest addition to the site! Sorry for no updates. Though chapter 12 of "Thoughts" is almost finished, I don't think I'll be updating for a while. A couple of weeks ago I went through a traumatizing event and I don't have the energy to go out and seek the internet outside my home (I'm still waiting for my internet service to get renewed. )Interestingly, the event that occured is similar to something I was planning to have Kaoru go through in my story. This is both good and bad. Good, because now I can really convey Kaoru's feelings in future chapters. Bad, because I get depressed every time I try to write. I'm slowly getting over this though and am starting to write again so don't worry about the story being abandoned.